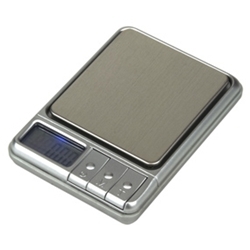 The "Bolt" digital pocket scale from US Balance features a bright blue backlight and silver casing. This instrument is packed with handy features and is ready to use right out of the box! The Bolt has quite a large platform size for such a compact device, and comes installed with a CR2032 battery for extended life. And did we mention the Bolt is the size of our "Excel" scale, but with TEN TIMES the precision? This sturdy and versatile unit is a clear step up in quality and performance. - Overall Size: 3.3" x 2.4" x 0.6"
- Platform Size: 2.2" x 2"